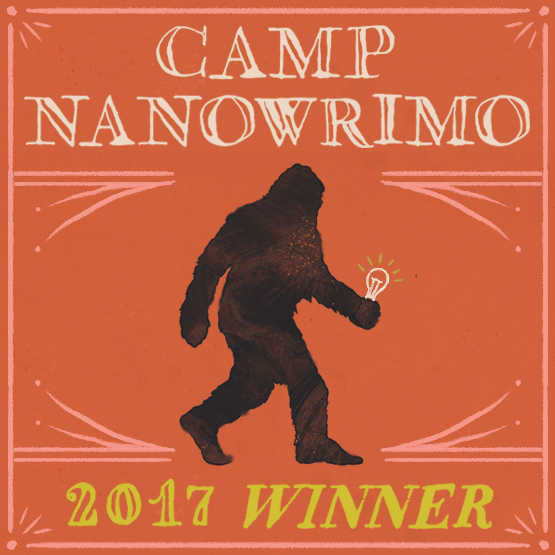 August is here and Camp NanoWriMo is over but unlike other challenges I have set myself, this time I can shout “I did it”. I limped past my target of 10,000 words and I have a sticker to prove it. I feel rather silly, feeling so proud of an image of a winner sticker; smiling like a 5 year old awarded a gold star for work well done but achieving something purely for me is rare. It feels uplifting and I am inspired to do more. This is handy as I have only skimmed the surface of scenes my WIP needs to become a fully fledged draft. A target definately helps to focus and write on days when it is easy to say “I will do more tomorrow” while a little squeaky voice reminds me that “tomorrow never comes.” Hopefully, the writing habit is here to stay. After all, 10,000 words a month equals 120,000 words a year which is a novel and more. On days, I couldn’t the feeling of frustration grew as my words and thoughts longed to be released. Even gobbledygook needs to be written now, it seems, just in case one sentence proves useful in the future. Is this a temporary phase or is an addiction creeping in? Watch this space to find out. So hello August and happy writing!